Neil Armstrong was a NASA astronaut and the first man on the moon or, more accurately, the first man to set foot on the moon. He was also an accomplished test pilot and a figure so large in American and world history that you can bet many generations from now people will still be talking about him, as well as his moon landing. 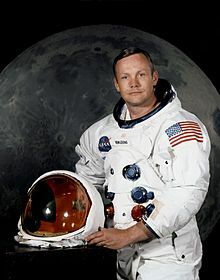 Neil Armstrong’s second and last spaceflight was as mission commander of the Apollo 11 moon landing, in July 20, 1969. On this mission, Armstrong and Buzz Aldrin (Buzz Aldrin arrived at the moon at the same time, but was the second man to actually set foot on the lunar surface). Since Armstrong was the mission’s pilot, it’s also said that he was the first person to land a craft on the moon. descended to the lunar surface and spent two and a half hours exploring, while Michael Collins remained in lunar orbit in the Command Module. Along with Collins and Aldrin, Armstrong was awarded the Presidential Medal of Freedom by President Richard Nixon; President Jimmy Carter presented Armstrong the Congressional Space Medal of Honor in 1978; he and his former crewmates received the Congressional Gold Medal in 2009. He was born in Wapakoneta, Ohio, on Aug. 5, 1930. His parents were Stephen Koenig Armstrong and Viola Louise Engel. Armstrong married his first wife Janet Shearon on January 28, 1956. Their first son Eric was born in 1957, followed by daughter, Karen, in 1959. Karen died of a brain tumor in January 1962, and the couple’s second son Mark was born in 1963. Armstrong’s first wife, Janet, divorced him in 1994, after 38 years of marriage. He had met his second wife, Carol Held Knight (b. 1945), in 1992 at a golf tournament, where they were seated together at the breakfast table. She said little to Armstrong, but two weeks later she received a call from him asking what she was doing—she replied she was cutting down a cherry tree; 35 minutes later Armstrong was at her house to help out. They were married on June 12, 1994, in Ohio, and then had a second ceremony, at San Ysidro Ranch, in California. He lived in Indian Hill, Ohio. Armstrong died in Cincinnati, Ohio, on August 25, 2012, at the age of 82, after complications from coronary artery bypass surgery. Armstrong was a naval aviator from 1949 to 1952. He served in the Korean War. As a NASA test pilot, Armstrong flew the X-15, a rocket-powered, missile-shaped aircraft that tested the limits of high-altitude flight. He flew more than 200 different aircraft, from jets to gliders and even helicopters. Armstrong was the pilot of the Gemini 8 mission, launched March 16, 1966. He performed the first successful docking of two vehicles in space (Gemini 8 docked with a previously launched Agena rocket). After his time as an astronaut, Armstrong was Deputy Associate Administrator for Aeronautics at NASA Headquarters. From 1971-1979, he was Professor of Aerospace Engineering at the University of Cincinnati. From 1982-1992, Armstrong was chairman of Computing Technologies for Aviation, Inc., Charlottesville, Va.
After Armstrong retired from NASA in 1971, he acted as a spokesman for several businesses. The first company to successfully approach him was Chrysler, for whom he appeared in advertising starting in January 1979. In 2010 he voiced the character of Dr. Jack Morrow in Quantum Quest: A Cassini Space Odyssey, a 2010 animated educational sci-fi adventure film initiated by JPL/NASA through a grant from Jet Propulsion Lab.